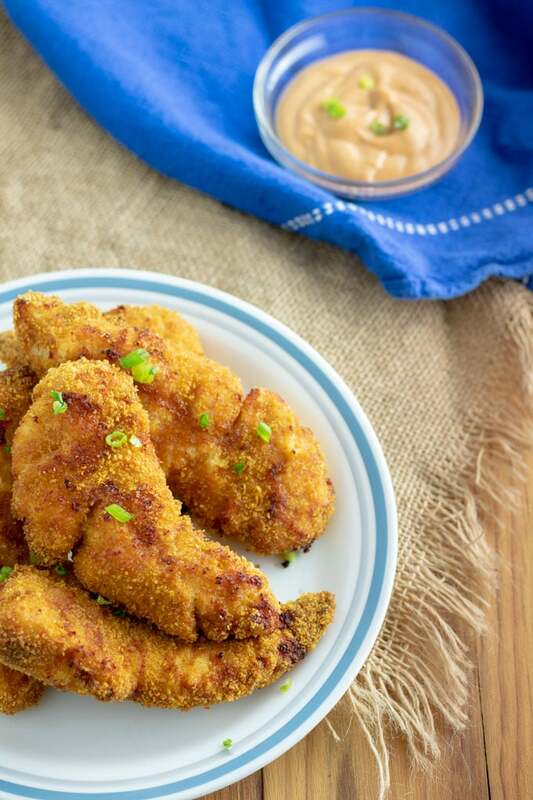 These Air Fryer Chicken Tenders are delicious and extra crispy! A fraction of the fat and calories of fried chicken tenders! The breading is also gluten free! Air fryers are a miraculous new invention. If you haven’t made the leap to air fryer cooking, now is the time to do so! Air frying takes a fraction of the time that baking does and the results you get are just as, if not more, effective at acheiving that ever elusive crispy crust that we all long for in fried foods! 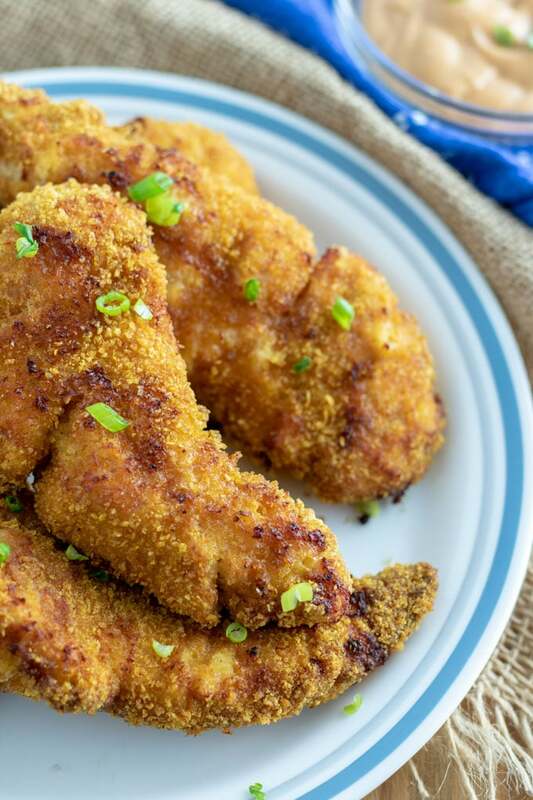 Are Air Fried Chicken Tenders Healthy? 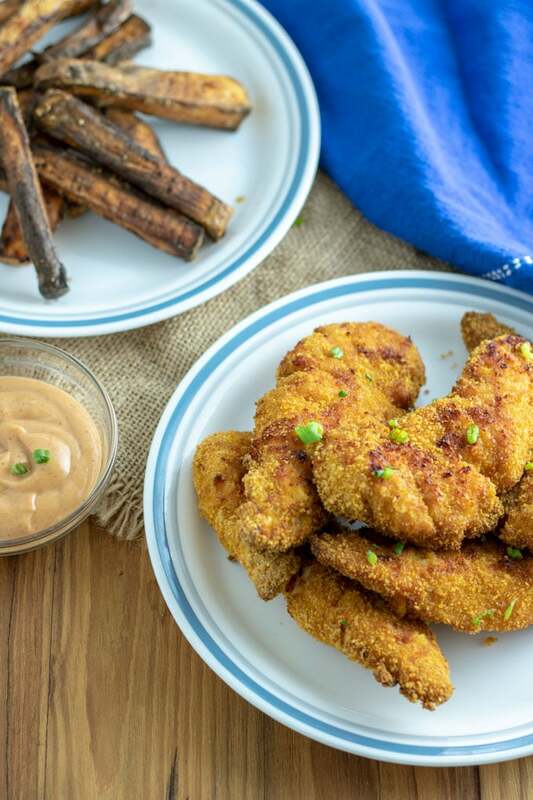 Are These Air Fryer Chicken Tenders Are Gluten Free? What Dipping Sauces Go Well With Chicken Tenders? 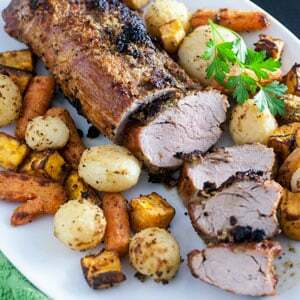 We love foods that are cooked in the air fryer! 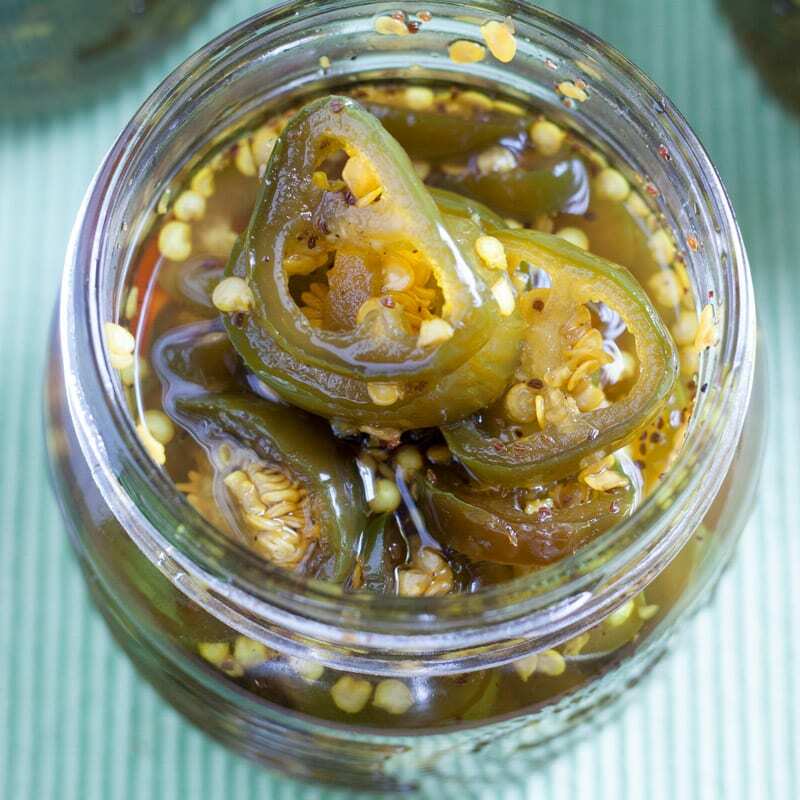 Although recipes require a bit of fine tuning, once you get the hang of your new air fryer, you can apply things that you have learned, through creating other dishes, to new foods! Each air fryer is different, so at first, constantly monitor your food so that it does not burn. Air fried chicken tenders will have considerably less fat than chicken tenders that are cooked in oil. 4 grams, as opposed to about 20 grams. The key with using your air fryer to make meals healthier for your family is to consider the fact that the key word in air fried, is fried. Although air fried foods require very little fat to get crispy, these are still breaded, so they will be less healthy than foods that are broiled, without the added carbohydrates. Yes. These Chicken Tenders are both Gluten Free and Dairy / Lactose Free for those of you on special diets! I prefer them to other breading because the corn flakes get extra crunchy! Don’t by packaged corn flakes crumbs, either! All you have to do to make your own is grind corn flakes cereal in your food processor for a few moments. 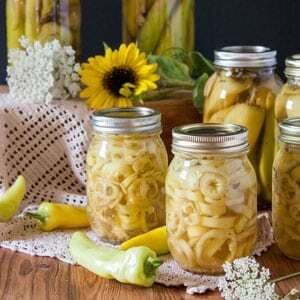 Store them in an air tight bag in your pantry and you will have homemade breading at your finger tips. Mix flour with salt and pepper in small bowl. Crack egg in another bowl. Mix cornflake crumbs, salt, pepper and paprika in a third bowl. 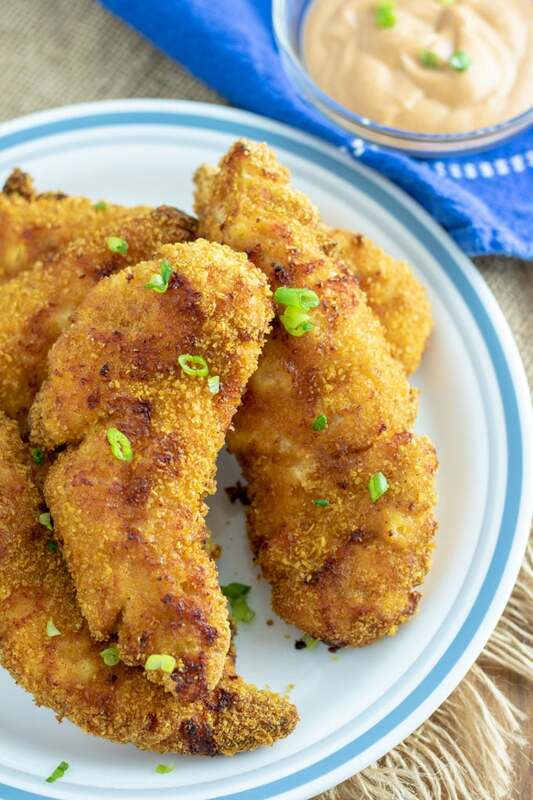 Dip chicken in flour. Shake off excess. Dip in egg, again, shake off excess. Press chicken down in cornflake mixture to adhere. 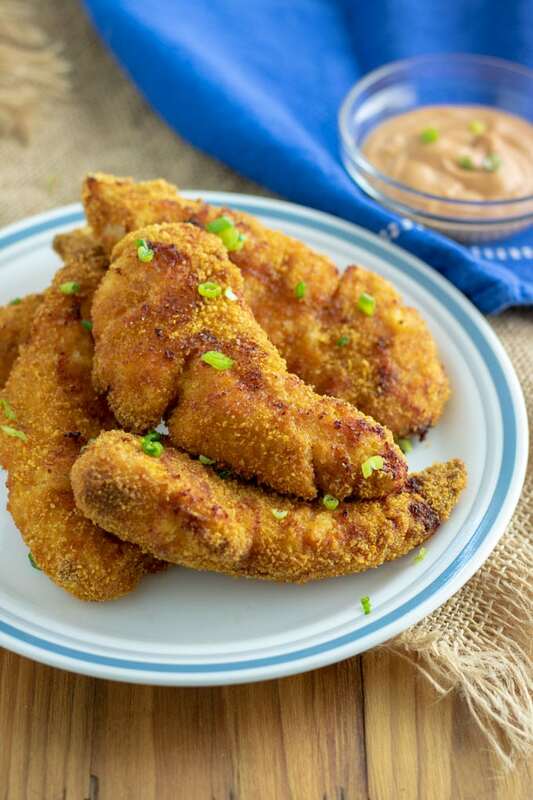 Place chicken tenders in air fryer basket. Spray both sides with cooking spray. Preheat air fryer to 425°F. Cook for 5-8 minutes on first side until browned. Flip with tongs and continue to air fry another 5-8 minutes, until internal temperature reaches 165°F. 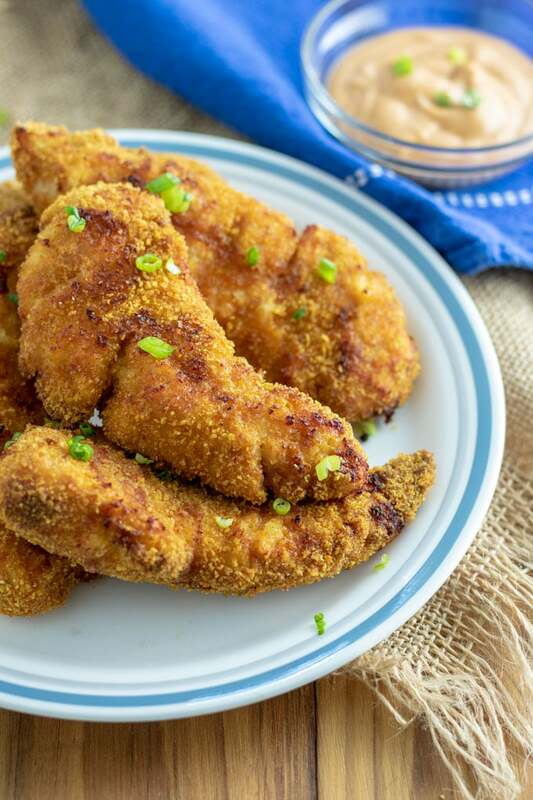 That’s how easy it is to make Air Fryer Chicken Tenders. Thanks for stopping by today! Preheat air fryer to 425°F. 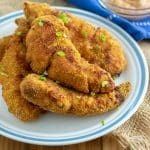 Dip chicken tenders in flour, shaking off excess. Then dip in whisked egg, letting excess drip off. Next dip in corn flake crumbs, pressing down to adhere crumbs. Place in air fryer basket, so that they do not touch. Spray with cooking spray on both sides. Cook on first side 5-8 minutes, depending on your air fryer. Check often. Once browned on the first side flip over carefully with tongs. Continue cooking for 5-8 additional minutes, until lightly browned, crisp. Internal temperature should be 165°F. I just got an air fryer. 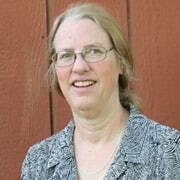 I have been searching for recipes and stumbled across your site. Are you planning to do air fryer shrimp recipes? That would be fun to see what you do. I definitely am doing shrimp recipes! Several of them that I can think of off the top of my head! 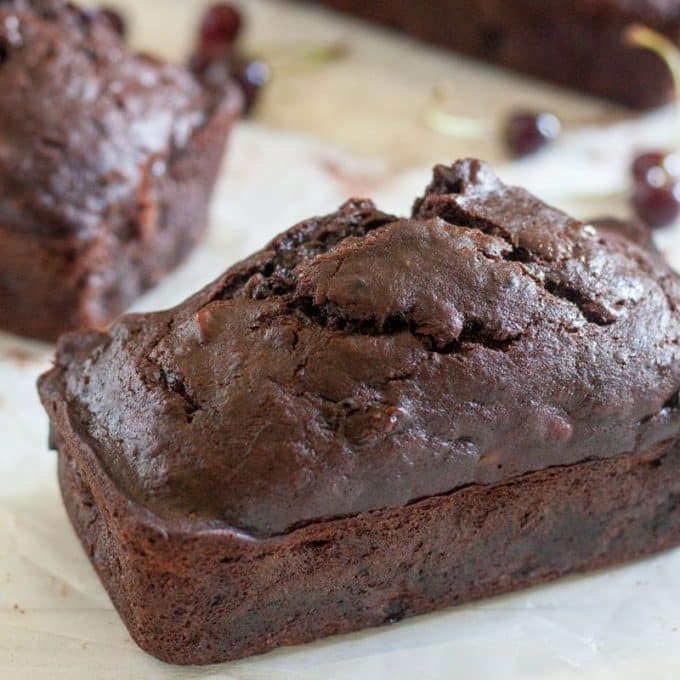 I have one recipe in testing right now! Stay tuned! And thanks Alexis!